Rythym Dog mentioned in a comment on my previous blog entry that he is surprised how few artists are using Rocket Shells drums. I wondered the same thing...why aren't more drummers opting for the consistent tone, durability, and reduced sensitivity to heat and humidity that synthetic drums offer? Why aren't we gigging with much lighter carbon fiber drums? As usual, I have a couple of theories...first off, I think drummers just feel more comfortable with wood shells. 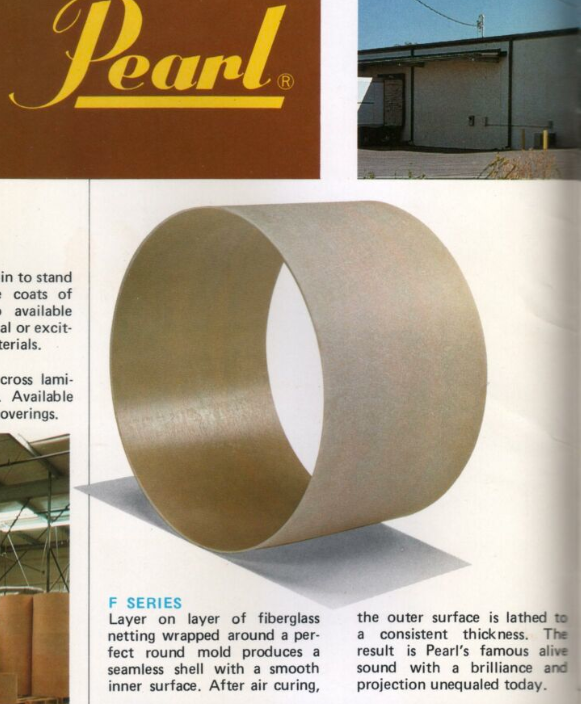 Ludwig's acrylic shells, though sought after now, never really took off in the 70s as Ludwig likely expected. 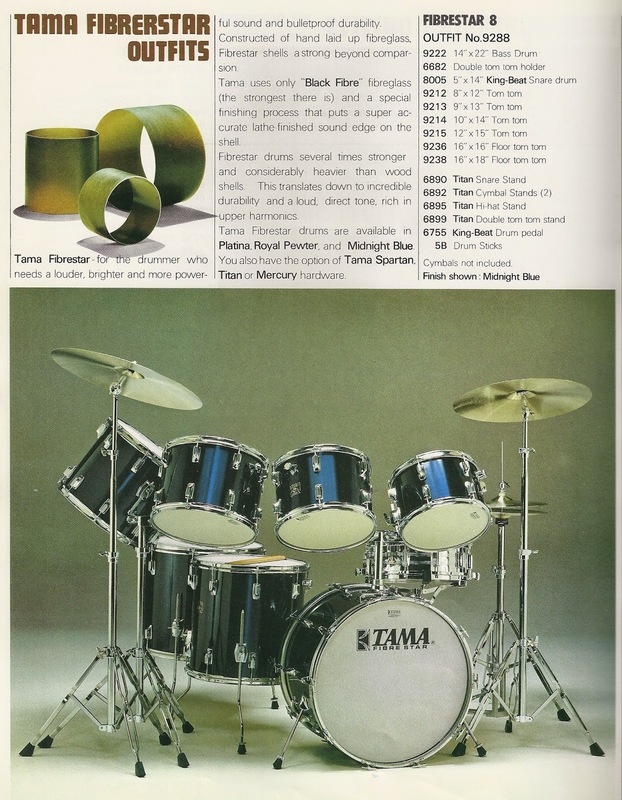 And Pearl and Tama offered fiberglass shells in the 70s and 80s that were incredibly loud, bright, consistent, and durable, but they didn't sell particularly well. Try to find a used Pearl "F Series" or Tama "Fibrestar" kit online today...it's not easy. Synthetic drum shells have never had a large following. Secondly, carbon fiber is expensive. Rocket Shells drums, especially when purchased new, were as expensive as premium wood kits. I think when drummers finally decide to part with their hard-earned money, they stick with what they know--because they have to know a lot to get a good sound out of their drums! Dollar for dollar, synthetic shells seem to be a riskier proposition. But what do we really know about wood drum shells? I'm not a materials expert, but it seems reasonable to assume that carbon fiber, acrylic, and fiberglass are much easier for drum manufacturers to mold into round and true shells with consistent tone. Most drummers will tell you that wood sounds "warmer," but that's subjective. When you consider that all wood laminate shells are actually a hybrid of natural and synthetic materials--some percentage of all wood laminate shells is the glue that holds the plies together--drummers' love affair with "wood" becomes even more interesting. John Good at DW Drums has altered the tone of wood shells by changing the direction of the wood grain between plies, so it's clear that characteristics specific to wood are important to the sound of a wood drum shell. The question is whether the characteristics specific to wood result in a truly superior drum sound. Given the natural variances in wood products, wood shells manufactured using identical raw materials and production processes could still have different sound qualities. The debate rages on drummers' forums as to whether those differences in sound quality create the effect that we call "warmth." One would think that given the amount of time drummers spend tweaking their sound with different head combinations, tunings, types of hoops, overtone control strategies, etc., we would all want to start with a consistent shell sound. And yet, most of us continue to choose wood! In the end, it comes down to experience. Rythym Dog recommended that I take a look at Rocket Shells back in 2010. Three years later, I finally take his advice and I'm stunned by the attack, the body, the tone, and even the look of my new Rocket Shells snare drum. Is my love affair with wood shells coming to an end? No...but if I'm ever back in the market, I will definitely be looking at shells constructed with synthetic materials, especially carbon fiber, or maybe a good ol' vintage fiberglass kit.